As production of aircraft engine components has increased in sophistication, Rose Metal’s engineering staff has worked closely with customers to design and fabricate each new generation of processing fixturing. Guided by ever present cost restrictions, our ongoing design task is to maintain required part support and orientation, create effective masking of portions of the part, facilitate loading / unloading … while optimizing fixture life by reducing distortion at temperature. In this case, pellet baskets were designed to hold donator material in a thermal coating process. 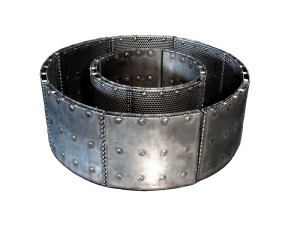 Product Description – Pellet Baskets made of Inconel sheet, custom perforated then fabricated to form 60 Degree radial section pockets.